Dharmendra Pradhan, Minister of State (I/C) for Petroleum and Natural Gas is on a visit to Bangladesh from 17-19 April 2016. The visit is aimed at following up on the ambitious agenda set between India and Bangladesh during the visit of Prime Minister Narendra Modi to Bangladesh in June 2015. On arrival in Dhaka, Mr. Pradhan called on Hon’ble Prime Minister Sheikh Hasina of Bangladesh. He conveyed that the India-Bangladesh bilateral relationship has become pragmatic and mature over the last few years. He discussed all bilateral issues pertaining to hydrocarbon sector between the two countries. Pradhan referred to the supply of 2200 MT High Speed Diesel (HSD) to Bangladesh from Siliguri Marketing Terminal of Numaligarh Refinery Ltd (NRL) to Parbatipur Depot of Bangladesh Petroleum Corporation (BPC) in Bangladesh and said that India was planning to continue supply of HSD in a sustainable manner. He noted the ongoing collaboration between companies from both countries in the hydrocarbon sector ranging from trade in petroleum products, exploration work and consultancy services. 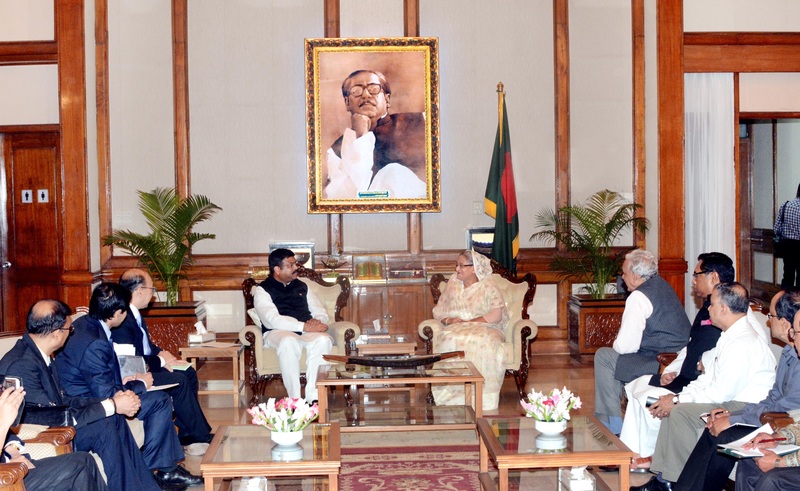 Dharmendra Pradhan thanked Prime Minister Sheik Hasina for encouraging support from her government. He shared the details of Indian hydrocarbon infrastructure project proposals in Bangladesh, including setting up of LPG import terminal at Chittagong by IOCL andsought favourable consideration for creating win-win situation for both sides. Shri Pradhan also discussed the ‘Indo-Bangla Friendship Pipeline’ and called it as an important project for both countries. During his stay in Bangladesh, Dharmendra Pradhan will meet Dr Tawfiq-e-Elahi Chowdhury, Adviser on Energy, Power and Mineral Resources to the Prime Minister and Mr Nasrul Hamid, Minister of State for Power, Energy and Mineral Resources of Bangladesh. On 18th April, Mr. Pradhan will witness signing of an MoU on broad aspects of cooperation in downstream oil and gas sector opportunities in Bangladesh between Indian Oil Corporation Ltd (IOCL) and BPC. He will also visit Chittagong on 19th April to witness award of contract by Eastern Refineries Ltd to Engineers India Limited (EIL) as Project Management and Consultant for its 3 MMTPA refinery expansion project. He is accompanied by CEOs of major Public Sector oil and gas companies and senior officials of his Ministry .